The deaths of a loved one, loss of a job or the ending of a relationship are difficult experiences for anyone to endure. It is normal for feelings of sadness or grief to develop in response to such stressful situations. Those experiencing trying times often describe themselves as being ‘depressed’. But sadness and depression are not the same. While feelings of sadness will lessen over time, the disorder of depression can continue for months, even years. Depression is a medical disorder (just like diabetes, high blood pressure, or heart disease) that day after day affects your thoughts, feelings, physical health and behaviors. Depression has a variety of symptoms, but the most common is a deep feeling of sadness. People with depression may feel tired, listless, hopeless and generally overwhelmed by life. Simple pleasures are no longer enjoyed, and their world can appear dark and uncontrollable. 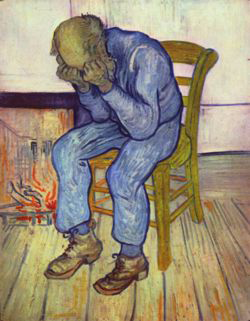 Emotional numbness and social isolation are common responses of depressed people. Depression can strike at any time, but most often appears for the first time during the prime of life, from ages 24-44. One in four women and one in ten men will confront depression at some point in their lives. Problems concentrating, thinking, remembering or making decisions. Loss of energy or feeling tired all the time. With depression, there are often other physical or psychological symptoms, including: *Headaches. *Other aches and pains. *Digestive problems. *Sexual problems. *Feeling pessimistic or hopeless. *Being anxious or worried. Fortunately, depression is very treatable. The majority of people who receive treatment, experience significant improvement, and almost all individuals derive benefit from medical care. Unfortunately, individuals may not recognize their symptoms as signs of an illness, or they may fear reactions of co-workers, friends and family. As a result, millions of people with depression do not seek treatment and unnecessarily experience problems and needless suffering. The costs of depression can be severe. The estimated financial costs of depression in missed days at work, medical expenses, and premature death is $43 billion annually. If you think you or someone you know is experiencing depression, consult Professional Counseling Associates for information on available resources and treatment options. An evaluation by a licensed therapist could be your first step in getting help. Remember, depression is one of the most treatable of all mental illnesses and with proper treatment; individuals can regain a healthy outlook on life.